THIS is how you end a trilogy. DreamWorks Animation wraps-up their fourth franchise with “How to Train Your Dragon: The Hidden World”. It’s also the studio’s first film under new distribution partner, Universal. Interestingly, the first “Dragon” (released in 2010) was distributed by Paramount. 2014’s “How to Train Your Dragon 2” was released by 20th Century Fox. And just as DreamWorks’ release strategy has evolved over the past decade, so has the “Dragon” saga. The original was sophisticated yet playful. The sequel was a bit more serious in tone. And this third and final chapter (appropriately deemed “The Epic Conclusion” in the marketing) is the most mature. If, like me, you were about 10 years old when you saw first “Dragon”, you’ve grown with this series just as the characters in it have. 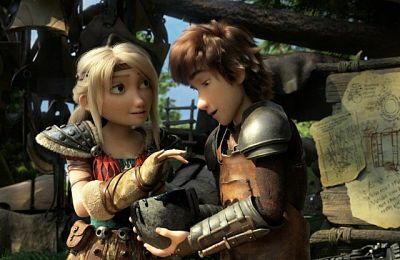 Hiccup and Astrid (once again voiced by Jay Baruchel and America Ferrera) are now young adults (“The Hidden World” picks up a year after the events of “Dragon 2”). Wedding bells may be in the future for these two, but there’s much to do first. That’s because there’s a new threat to the Vikings and the ever-growing population of dragons who now live peacefully together on the island of Berk. The evil Grimmel (F. Murray Abraham) is a Night Fury hunter-killer. When he learns of the existence of Toothless, the black dragon becomes his target. So Hiccup and his motley crew must gear-up to battle this villain and his deadly, chemical-induced dragon creatures. Complicating things is the presence of a bright white “Light Fury”. She catches Toothless’ wide green eyes. This romantic infatuation separates Toothless and Hiccup for the first time in the series, forcing the once inseparable friends to try to achieve greatness – on their own. Dean DeBlois returns as writer and director of “Dragon 3”. The script is a balancing act of action, humor and romance, with a deep emotional core. Taking a backseat: dialogue. There are several extended scenes in which no words are spoken. As Toothless and the Light Fury begin to bond, “Dragon 3” starts to give-off some “WALL-E” vibes. These two are another black and white star-crossed lover animated duo who use unique communication skills to show their affection. Their “getting to know you” and courtship sequences are nice, but they do go on for a bit too long. DeBlois attempts to lighten the serious tone from time to time, using some of the wacky Vikings as comic relief. These scenes are totally unnecessary. I understand their purpose, but if all these moments had been written out the film, “Dragon 3” would have been even stronger. As has been the case since the first scene of the original, the visuals create rich, poetic moments, especially when we’re (eventually) introduced to The Hidden World. Composer John Powell takes the music of the franchise to new heights. And the voice cast delivers more effective, even deeper performances, particularly Ferrera and Gerard Butler (whose Stoick shines in a few key flashbacks). Like the first two chapters, “How to Train Your Dragon 3” isn’t designed for young kids. Current 5-8 year-olds who may have seen the other movies on TV or DVD aren’t going to get the most out of this experience. This movie is made for the teens and 20-somethings (and their parents) who’ve been with “Dragon” from the start. “The Hidden World” – especially the final 15 minutes – is moving, heartwarming and heart-breaking. Tears will flow from someone in your aisle. And that person may just be you. Overall, “Dragon 3” is a soaring send-off. Ranking the trilogy, I’d say “1” is slightly better than “2”, which is just slightly better than “3”. But they’re all very good films: well-crafted and well-intentioned. And all will hold-up decades from now, when many current animation franchises have been forgotten. On The Official LCJ Report Card, “How to Train Your Dragon: The Hidden World” gets a B+.